In our late teens, a good friend and I bowled often just for fun at the Rocket Lanes in Dover-Foxcroft, Maine. This guy was long and lanky and famous for his through the roof style bouncing balls off the ceiling. It was hard to tell if it was his typical late release, or intentional. No, he wasn’t a muscle man. Balls for candlepin bowling are 4.5″ in diameter (the size of a softball) with a regulation maximum weight of 2 pounds and 7 ounces. Regardless of my friend’s excuse, he was ejected more than once before we got our money’s worth. My parents were especially active bowlers. After years of league play, the 40-50 trophies in their collection were becoming tiresome dust collectors. Rather than toss them in the trash, they stripped the brass nameplates and had each replaced with the engraved name of one child in a small league of special ed handicapped children. Each received a personalized winners trophy and the smiles were worth a million. Bowling isn’t the same anywhere else when it comes to candlepin bowling as played in New England or the eastern provinces of Canada, New Brunswick and Nova Scotia. Candlepin is common and almost exclusive to this area with the rare exception of one alley in Ohio and maybe Montana the last time I checked. In high school league competition was 3 strings, and a total of 400 pins or more in 3 strings was outstanding. 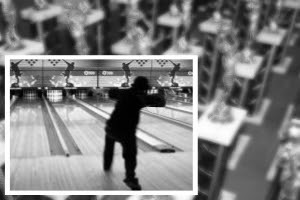 The world record for one game is 245 set in 1984 by Ralph Semb in Massachusetts, and after 15 years of controversy about the event being sanctioned, the game was finally recognized as the world candlepin bowling record in 1999. It still stands. Scoring is the same as tenpin bowling where an above average bowler may score 300 in a single game several times in a lifetime. Pros expect nothing less than 300 each game. In candlepin, the pin shape and 4.5 inch ball make a big difference when bowling for a perfect 300 game. It becomes even more difficult bouncing balls off the ceiling.